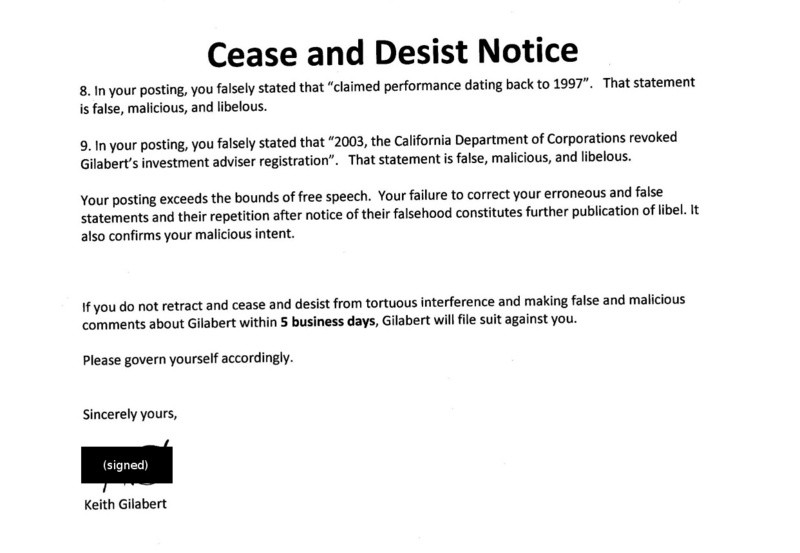 Update, 2011-11-18: Ann Logue has re-posted her original writeup on Gilabert and GLT, along with her own scathing reply to Gilabert's ridiculous threats—including the point that the California statute of limitations for libel on the post expired three years ago. So much for Gilabert's farcical code-citing. Update, 2011-11-14: It appears that Gilabert pled guilty and was indeed sentenced (see first three articles, just added above); so it is all the more ridiculous he is attempting to squelch our publication. We've redacted the third page, the "Exhibit" of the article orginally posted. First point: where Gilabert mentions "your posting dating 2007-07 by KrKeenan.com", this makes absolutely no sense. KrKeenan.com is another site, which contained an outside article about Gilabert's SEC/DoJ legal woes—it was not "on" hf-implode.com and has no connection to us. In fact, the KrKeenan.com site appears to be completely gone. The cited post about Gilabert/GLT Venture Fund is also gone, though a cached version is available at archive.org (hint to Gilabert: archive.org is not us either). Second, defamation is not at issue, since that charge only applies to the spoken word. Gilabert probably means "slander", but obviously that term doesn't apply either, because none of the statements in our article are on their face offensive, and those that levied any charges were simply re-reporting of externally-cited materials (from the KrKeenan.com article and others, as well as Department of Justice and SEC reports of charges, allegations, and settlements, which are pretty much the complete source for all the media articles, as far as we can tell). The statements thus certainly do not qualify as "defamatory per se", since they are not on their face libellous/slanderous/defamatory, as they could be true as far as we knew (certainly the reports of the SEC and DoJ's own statements are per se true—the government did state them). Similarly, Gilbert's use of the term "malicious" is inappropriate, because it can't be malicious to be a second-hand reporter of statements (allegations or otherwise) coming from a government entity (or really, any third party which is reasonably believable). It is thus more than a bit presumptuous to claim we wrote "maliciously to injure Gilabert and to increase traffic to your site". We had no specific interest in Gilabert other than as a (small) part of reporting hedge fund distress and fraud generally. Further, there is also no rational connection between allegedly "injuring" Gilabert and increasing traffic to the site—if we were knowingly publishing false statements (the only legally-meaningful definition of "injuring"), then traffic would certainly fall to our site, as it would quickly become apparent that it was filled with falsities. Instead, our sites have remained immensely popular, as it is widely understood that we report, and strive to report, only the truth. Really, Gilabert suffers from an unduly inflated opinion of his own self-worth, if he thinks that publishing shlock about such a minor figure as himself would "increase traffic" anywhere. It wasn't until his ridiculous threat today that he elevated his activities (in a bad way) to anything more significant than (by his own admission) bilking a few local investors. And the "tortious interference" bit is just asinine. We have absolutely no knowledge of what "business" Mr. Gilabert is involved with today (if any), thus there can be no such inteference without knowledge of what exactly we would be intefering with. Further, we are in no business ourselves (except online publishing), thus our activities obviously cannot constitute business "inteference" of the kind covered by applicable law. Certainly second-hand reprinting of government reports of Mr. Gilabert's actual or alleged past misdeeds do not qualify. Of course, if that's "tortious inteference", Mr. Gilabert should sue the LA Times first. The final overarching point is that Gilabert doesn't explain what legal regime is identified by "CCP" or why it should apply to hf-implode. (1) "Gilabert cost investors about $14 million"—our article never stated this; not even remotely. (3) It was the KrKeenan article that reported that the SEC alleged payments out of "phony profits". Thus this allegation was two levels removed from us (and is traced back to a government legal complaint). (4) In reporting "commission kickbacks", we were simply repeating the KrKeenan report, which in turn was simply reporting the US attorney guilty plea attained from Gilabert associate Justin Paperny. Perhaps Gilabert should sue Paperny for "defamation" for agreeing to plea guilty to something that "wasn't true!" (5) This is another complaint about the "phony profits" point. As above, it was the SEC itself alleging such. HF-Implode cannot respond directly to any of the other points, as Logue was the writer and researcher, and is the only one can say what sources were used for these items. However, the above should serve as plenty to illustrate how the report was obviously within the bounds of free speech, and certainly not "malicious", given things that had already been reported and released by the US government (and other public sources) regarding Gilabert's operation. 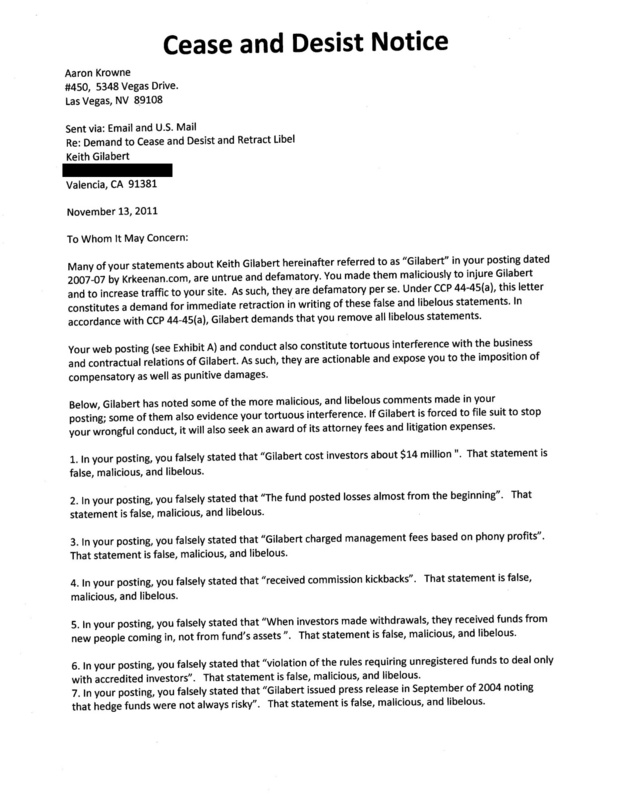 What it appears to us is that Gilabert has paid his penance and/or worked out whatever settlements necessary to resolve the legal disputes connected to GLT Venture Fund, and is now embarking on a "sweep and clean" to expunge any record of malfeasance from the internet. Well, in our experience, this kind of "sue to silence" behavior is 100% correlated with guilt—and additionally, is usually intended to cover up even greater wrongdoing than has been included in government and/or private settlements/proceedings. Thus, this all piques our curiosity even more. We wonder what Mr. Gilabert has to hide.